Football, History, Video Games, and oh yeah! The Colts! Definitely entertaining and promising. I'm seeing a lot of positive talk about it on social media as well. If you accept it for what it is, you're going to enjoy watching this league. My main concerns going in were shaky OL play, and not enough good QB's. So far, those look to be true, but what do you expect? Living in the Tampa area, I suppose i'll be rooting for Orlando. I also love Spurrier from his Gator days I'm just glad to have 10ish weeks of football to watch. You really enjoy the phrase "blow down the field" don't you? Variety is key. Well, tbh, if I were to bet on this game, I'd probably put money on the Chiefs. I definitely don't think we'll be blown out, and I do believe we can win, but I think they have too many weapons and some of our defensive personnel may get exposed. I'm a little worried about the offense too. We really only seem to be great on offense for 30 minutes at a time lately. The Giants, we came alive at the end, and against the Titans and Texans, we were impotent after halftime. An argument could be made for the latter two that it was somewhat by design to chew clock, which is somewhat my hope. We'll see I suppose. This will be a great test for us though. Hope we can pull it out!! Yeah, Mack was great this year! Obviously, I'd expect us to at least kick the tires on Bell if he really wants to come here, but with how well our line is playing, there is absolutely no need to pay Bell what he was asking the Steelers to. With Mack and Hines, though, I like our RB stable. It was good seeing Wilkins come in and run hard last night as well. Leonard gets his first pick!!! Gah, I have so many Jerseys already: 3 Peyton Mannings (different tiers of quality as I got older and could afford them), Bob Sanders, Dwight Freeney, Robert Mathis, Andrew Luck. 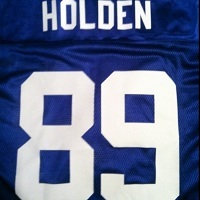 I also have my custom Holden 89 jersey (It was a gift, don't judge me.) I guess next person I would look for may be Leonard if he can keep up this pace. I tend to prefer defensive player Jerseys. I think finally connecting on the deep pass to TY helped his confidence. Then, when he was able to throw it downfield for the Hail Mary (too hard even as the ball got there early). After that, I saw the Luck we're all used to. Suddenly, he was running for first downs. Throwing into tight windows with a ton of zip. Hitting longer completions like it was nothing. I'm sure the Texans defense being tuckered out was a contributing factor, but I definitely liked what I saw from Luck at the end of the game today. With Luck's struggles why would they open the roof? From a pure football perspective, I don't think the roof makes much of a difference, save maybe on kick/punt returns or really deep passes when the ball is high up in the air. Which is...what every player in the NFL deals with in an Outdoor stadium. Non-issue. Aesthetically, I don't really like how it makes the one part of the field so much brighter, but that's just my opinion, and I don't feel all that strongly about it. Good luck Colts...I think you're gonna need it. Did someone say cookies? chocolate chip or peanut butter? Not those kind of cookies...Bummer, I hate being disappointed man. LOL!